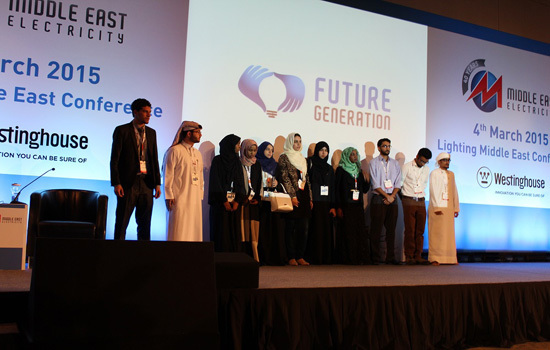 Engineering students from RIT Dubai won the Official Judges’ Award at the Future Generation Competition, one of the largest power events in the world that highlights the potential and innovation of undergraduate engineering students in the United Arab Emirates. Anishta Lakhani, Bilal Sharqi, Mohamed Amin and Sami Jouaneh entered “Solar Powered Car and Desert Cooler,” which involved a prototype that harnesses the sun’s energy to cool a car without using the car’s engine or existing cooling system. By placing a solar panel on the roof of a car, electricity can be generated and stored in a battery. This power will be supplied to a system of thermoelectric coolers that provide a cooling effect when the car is parked and the engine turned off. Using solar power for the energy source, thermoelectric coolers are used to bring down the temperature inside a parked car, which is especially effective during the scorching summer months. The judge’s award was decided by a panel of three industry experts who reviewed all of the entries. RIT Dubai entered another project, “Automotive Thermoelectric Generator,” which placed second. The participants were Hamza Hashmi, Michelle Jayawickrama, Mohamed Amin, Sami Jouaneh and Syed Siddiq. Since RIT opened one of its global campuses in Dubai in 2008, part of the university’s overall strategy has been to enhance research, innovation, and to support the realization of the UAE Vision 2021 in vital areas such as sustainability, energy efficiency and sustainable environment. The campus, located in Dubai Silicon Oasis, houses two main research centers for its engineering students: the Energy & Sustainability Center and the Mechatronics Laboratory. The focus of this program is on energy sustainability and efficiency in the UAE and the rest of the world, and this award-winning project is only one of the many innovative solutions students have created. For more information, go to http://www.rit.edu/dubai/. Established in 2008, RIT Dubai is a not-for-profit global campus of the Rochester Institute of Technology. RIT Dubai offers bachelor’s and master’s degrees in business and leadership, engineering and computing. It offers American degrees, and all of RIT’s programs are UAE accredited. The faculty consists of outstanding professors from the United States, the Middle East, and around the world. RIT Dubai is located in Dubai Silicon Oasis, a technology park with over 900 companies such as SAP, Henkel, Schneider Electric, Fujitsu and Axiom.